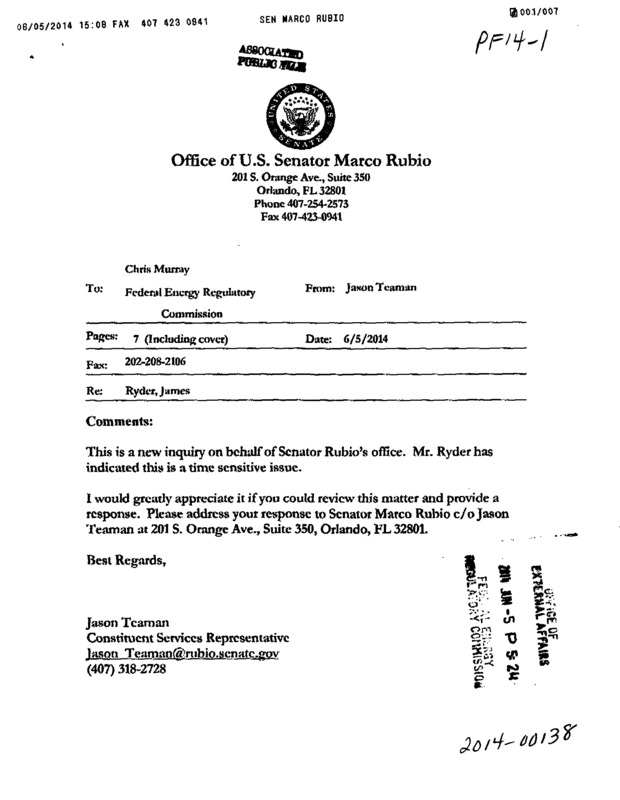 This is a new inquiry on behalf of Senator Rubio’s office. Mr. Ryder has indicated this is a time sensitive issue. I would greatly appreciate it if you could review this matter and provide a response. 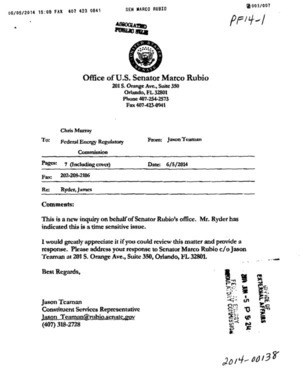 Please address your response to Senator Marco Rubio c/o Jason Teaman at 201 S. Orange Ave., Suite 350, Orlando, FL 32801. Need help on getting a just and proper routing of a 3rd easement on our property. Jpg map (survey plat) showing property, easements and proposed solution. 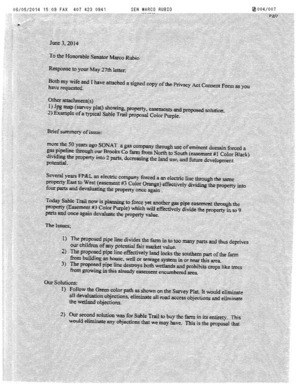 Example of a typical Sable Trail proposal Color Purple. 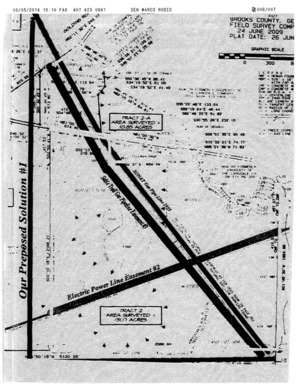 more the 50 years ago SONAT a gas company through use of eminent domain forced a gas pipeline through our Brooks Co. farm from North to South (easement #1 Color Black) dividing the property into 2 parts, decreasing the land use, and future development potential. Several years FP&L an electric company forced an electric line through the same property East to West (easement #3 Color Orange) effecively dividing the property into four parts and devaluating the property once again. 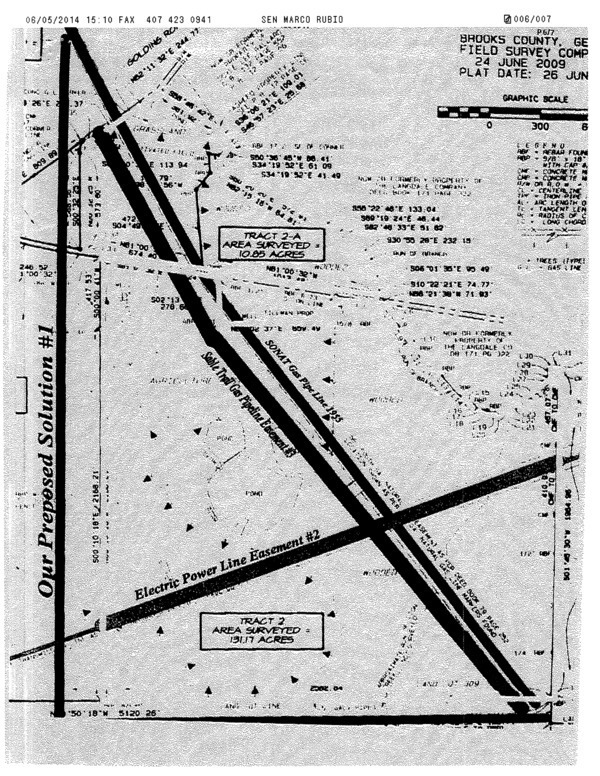 Today Sable Trail now is planning to force yet another gas pipe easement through the property (Easement #3 Color Purple) which will effecively divide the property into 9 parts and once again devaluate the property value. The proposed pipe line divides the farm in to too many parts and thus deprives our children of any potential fair market value. The proposed pipe line effectively land locks the southern part of the farm from building an house, well or sewage system in or near this area. The proposed pipe line destroys both wetlands and prohibits crops like trees from growing in this already easement encumbered area. Follow the Green color path as shown on the Survey Plat. It would eliminate all devaluation objections, eliminate all road access objections and eliminate the wetland objections. 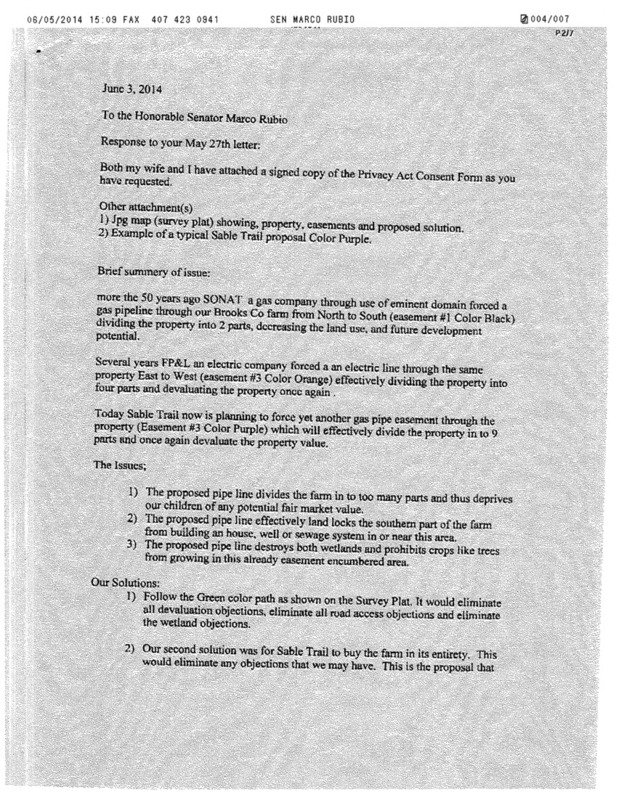 Our second solution was for Sable Trail to buy the farm in its entirety. This would eliminate any objections that we may have. This is the proposal that we dislike the most as it is our intent to leave the farm to our children at sometime in the future. Over the past few months, Sable Trail, has made several proposals, each one more riducules then the precious. It seems that they just draw lines at random, as they clearly do not address our major issues. Recently the propsoed to buy the lower 130 acres at $3000 an acre. This still dose not addres the issue on the upper farm track. To have the property properly evaluated by a realtor and a registered forester, it would take time and cost us approximatly 8% of the lands value. Sable Trail has said they want our counter proposal by the 6th of June. Contact FERC and Sable Trail and help persuade them that best and most just solution is to take the GREEN path on the map. I attempted to be brief, however, this is not a brief subject. 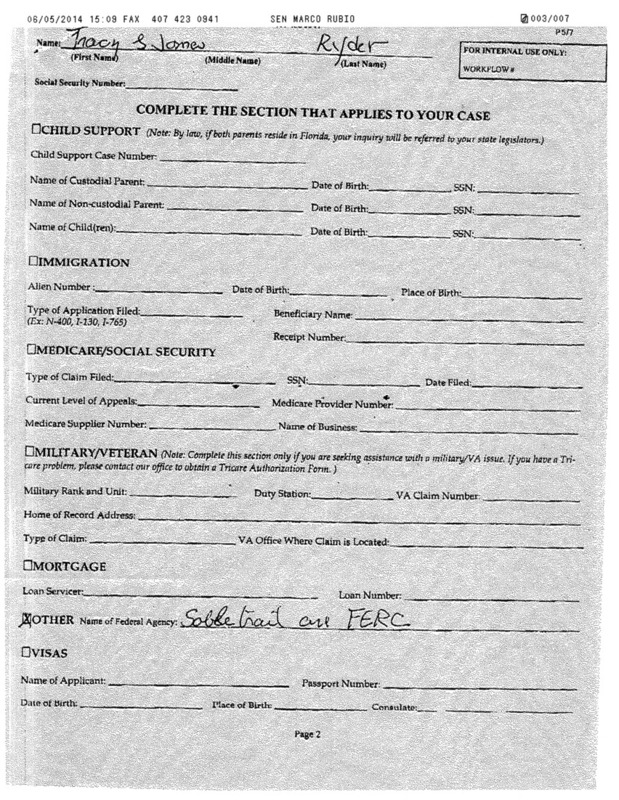 See my letter mailed to you on May 6th for an in depth description. 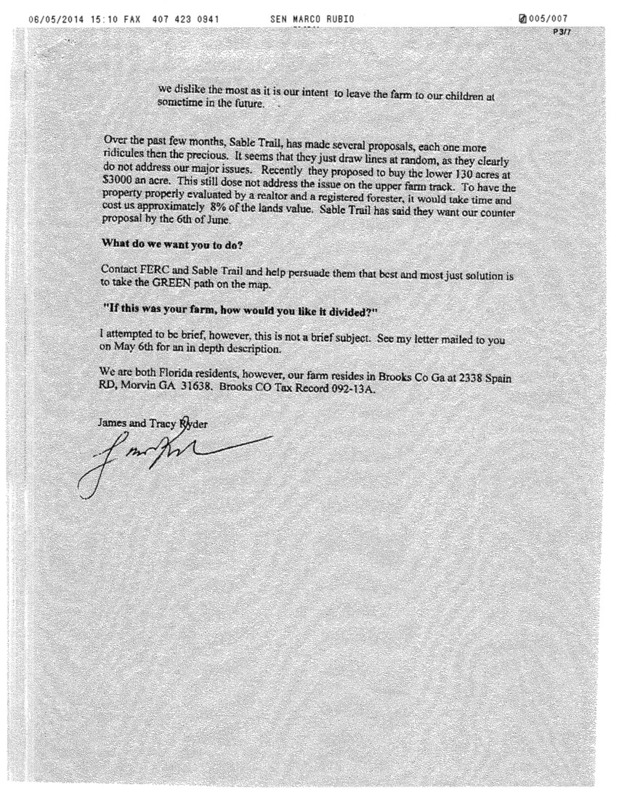 We are both Florida residents, however, our farm resides in Brooks Co Ga at 2338 Spain RD, Morvin GA 31638, Brooks CO Tax Records 092-13A. 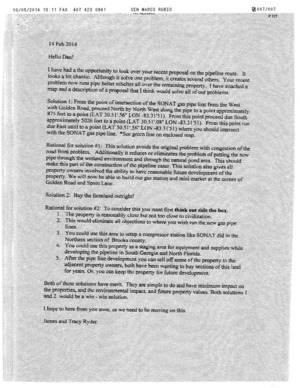 And finally the Ryders included a copy of their proposal to Spectra of February, which they also filed with FERC back then. 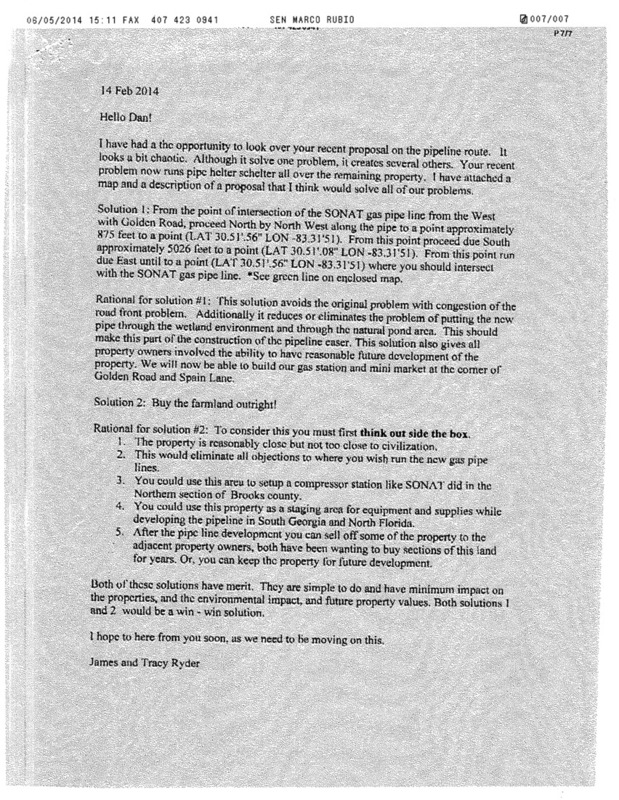 It also included the question Spectra’s Susan Waller didn’t even want to hear: if the Sabal Trail pipeline won’t damage property values, why doesn’t Spectra buy up all the affected property and resell it later at a profit? 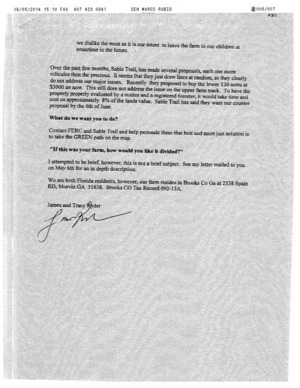 The Ryders have been complaining to FERC about the raw deals Sabal Trail is offering them since at least December.